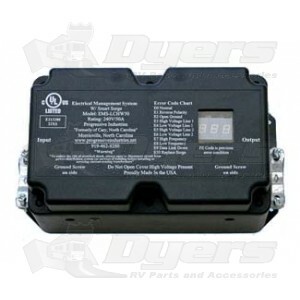 The Elecrtical Management System provides total electrical protection of all your RV electronics and a complete digital display of the AC power source. Enclosed blue jumper wire allows the user to bypass the computer circuit in the EMS in the event of computer failure, thus allowing AC power into the RV. This does not disable the surge protection portion of the EMS; however, all other features are disabled. Time Delay for A/C Compressor. Modular Design for easy to install replacement parts. A must have for RV. Easy to order. Arrived quickly and the best price. Good instructions. Unit was easy to install. Would recommend getting a good wire cutter/stripper tool as 6 gauge wire is thick. More difficult to install than expected. You need heavy duty wire cutters or hacksaw to cut #6 wire. Wire is very stiff and difficult to position into the limited space of the unit. Another inch or two where the wires tighten down would be helpful. Company is very helpful with questions. This is the hardwired unit, a great product. Easy install, the hardest part was me working inside the bin. Dyers great pricing, free shipping (on this product when ordered), received product in less than 24 hours from order time with standard free shipping. This hardwired EMS was easy to install and took only about 30 minutes. Instructions were clear. There are pictures of the wiring on the company's web site that are not in the manual sent with the unit. This was helpful.